Clocks, Watches, Scientific Instruments | Militaria | Skinner Auction 2652M | Skinner Inc.
MARLBOROUGH, Mass. – April 26, 2013 – Skinner, Inc. will host an auction of Clocks, Watches & Scientific Instruments on Saturday, May 4th in its Marlborough gallery. The sale features an eclectic variety of French, English and American clocks, early watches and science material. In conjunction with this sale, Skinner is proud to announce the first auction of Historic Arms & Militaria presented by expert Joel Bohy. 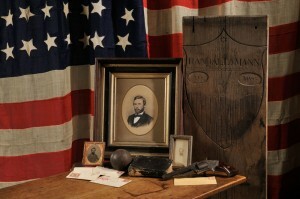 The militaria portion of the auction features flintlock and percussion muskets, pistols, and Civil War archives. The auction’s cover lot is a French white marble and ormolu annular dial clock from the third quarter of the 19th century (lot 361, estimated between $15,000 and $25,000). The clock depicts a bronze standing cherub with gilt quiver and an outstretched arm that points to the current time. In addition to the sophistication of its timekeeping mechanism, the piece is a magnificent work of art – with classical ormolu friezes and foliate figures among the many designs adorning the piece. A classical French lyre clock and garniture circa 1870 (lot 360, $8,000 to $12,000) marries precision timekeeping with beautiful period decoration. 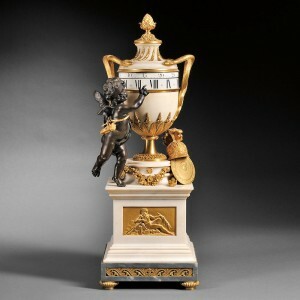 The variegated green-marble lyre-form case is decorated with applied ormolu beading and a figural sunburst at the top. Two matching vase-form candelabra complete this functional and decorative set. A Morris Tobias binnacle timepiece with fusee movement, London, circa 1795 (lot 320, $4,000 to $6,000) provides a fine example of nautical timepieces offered in the sale. It comes to Skinner from the Time Museum which was open to the public for nearly 30 years in Rockford, Illinois. After it closed, the collection was moved to the Chicago Museum of Science and Industry where it was exhibited from 2001 to 2004. American clock offerings include unique and unusual pieces. An American rocking ship tall clock by Simon Willard circa 1810 features a painted arch with a rocking ship automaton (lot 449, $10,000 to $15,000). Willard’s eight-day clocks were sold with painted moon’s age and rocking ship automaton arches. While the moon’s age arch had practical implications, automaton arches were very popular with a clientele fascinated and amused by ships moving with the swing of the pendulum, as if by magic. A classic New Hampshire mirror clock circa 1825 by Joseph Chadwick (lot 458, $2,000 to $3,000) comes to Skinner in an excellent state of preservation, with undisturbed dial and signature, and original glazing. 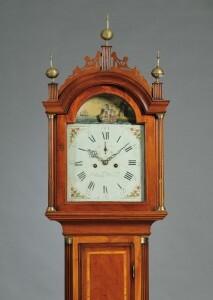 A mahogany “Brooklyn” lever spring shelf clock is an extremely rare example by Joseph Ives (lot 484, $10,000 to $15,000). This experimental clock was designed to utilize a wagon spring to run the clock. Navigational tools of note include a T.S. & J.D. Negus brass telltale ship’s compass circa 1870 (lot 508, $1,500 to $2,000). This type of compass was designed to be suspended over the bed of the ship’s captain so a ship’s bearing could be monitored during periods of rest by captain and crew. A mahogany and boxwood 15-inch octant circa 1782 (lot 507, $2,500 to $3,500) and an 18th century Dutch horizontal sundial (lot 506, $1,200 to $1,600) will also be offered. Skinner is pleased to bring Historic Arms and Militaria to auction as a new specialty focus under the direction of Joel Bohy. 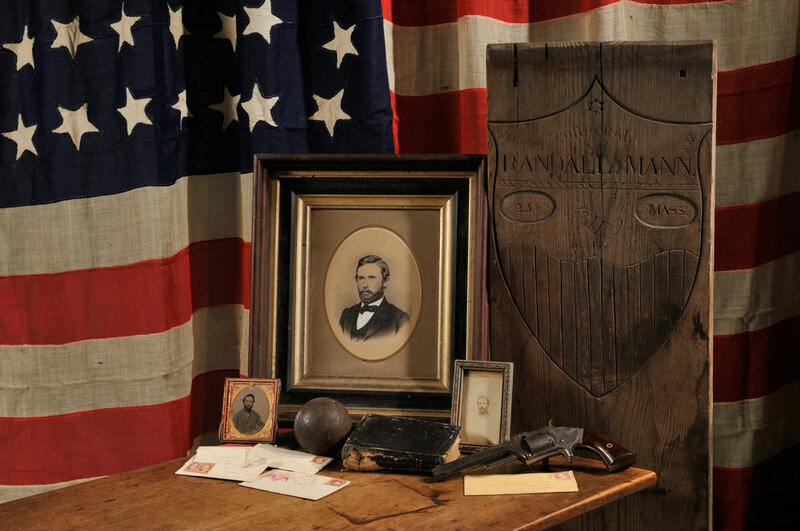 The inaugural auction features a collection of material once belonging to Corporal Randall Mann of the 25th Massachusetts Civil War Regiment. The “Massachusetts 25th” attacked Roanoke Island, North Carolina on February 8th, 1862. Forty-two men were wounded in the battle and six were killed, including Corporal Mann. Mann was carrying a Bible in his pocket at the time he was shot, with the bullet piercing the book before mortally wounding him. In addition to the Bible, his temporary wooden grave marker, pistol, and other personal effects will be offered (lot 149, $8,000 to $10,000). Corporal Mann’s grave marker is particularly rare. Subject to as they were rot and decay, few wooden grave markers from the Civil War era remain today. Two black powder kegs, both marked with the grade of powder they contained (lot 131, $300 to $500), form another rare offering. More than 100 lots of military weaponry will be offered. Highlights include late 18th century Italian cased Frachetti e Minelli flintlock pistols with burlwood stocks, ornate silver inlays, and gilded engravings on the barrel (lot 23, $3,000 to $6,000); a pair of French belt pistols with walnut stocks carved with dog’s heads (lot 18, $3,500 to $5,000); and a pair of French brass barrel flintlock pistols (lot 14, $3,000 to $4,000). A 1769 short land pattern Brown Bess musket (lot 233, $7,000 to $10,000) and a brass-hilted American hanger decorated with cutout hearts on the hilt circa 1770-1783 (lot 85, $800 to $1,000) will also be offered. A 19th century “Duke of Cambridge” flintlock double game gun (lot 265, $15,000 to $25,000) from 1801 was made for Prince Adolphus Frederick, Duke of Cambridge from 1801 to 1850. Born in 1774, he was the seventh son of King George III of England. This outstanding hunting rifle was purchased at auction by the grandfather of the consignor around 1900. Previews for the auction will be held on Thursday, May 2, 2013, 12 p.m.-5 p.m., and Friday, May 3, 2013, 12 p.m.-7 p.m., and Saturday, May 4, 2013, 8 a.m.-9:30 a.m. A gallery talk and reception will be held on Friday, May 3rd from 5 p.m.-7 p.m. at the Skinner Marlborough gallery, 274 Cedar Hill Street in Marlborough, MA. Please call 508-970-3240 to register or RSVP online. An illustrated catalog for sale #2652M is available by mail from the subscription department at 508-970-3240. It is also available at the gallery. This entry was posted in News and tagged american clocks, antique arms, antique clocks, astronomical, Civil War, compass, early watches, european clocks, french clocks, horological, Joel Bohy, Militaria, militaria auction, military antiques, muskets, navigation, pistols, regulator, revolutionary war, Robert Cheney, scientific instruments, timepieces, world war II by Skinner. Bookmark the permalink. I am looking for info on a pair of dueling pistols. On the barrel top are the words Manufacture Francaise d’Armes & Cycles de Saint-Etienne. Under the fore stock and on the barrel: 1/336.104.AE. JG.2 and a manufacturer’s trademark or symbol. Crossed rods with a circle in the middle,with an arrow through the middle. An M on one side and an F on the other between the rods. On the bottom of the fore stock are the nos.1/336 . If you could shed a little light on them I would appreciate it . They are in a boxed set.